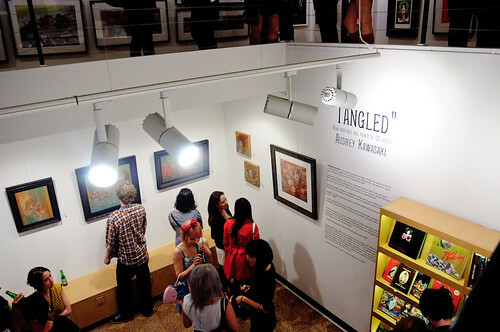 Last Friday I went to the opening night of Audrey Kawasaki’s “Tangled” exhibition. I’ve been such a fan of her work for a few years now, but this was the first time I’d ever seen her work in person (I missed her show the last time she came to Sydney). Even if you don’t know her name, you probably know her work. 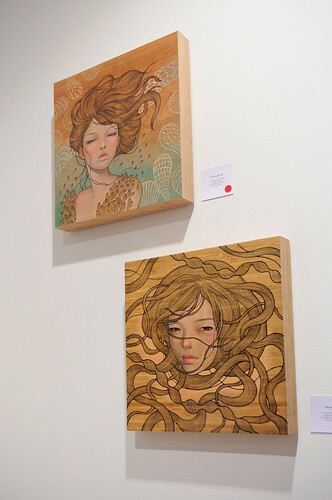 Seductive girls with heavy eyelids gazing out from wooden panels. 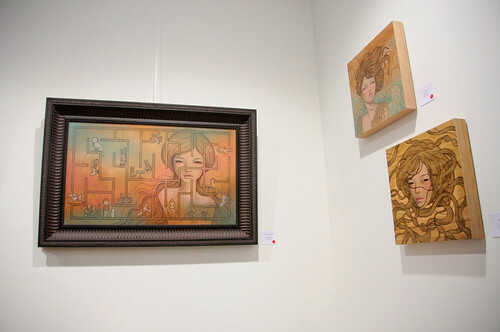 I love that you can tell an Audrey Kawasaki just from looking at it. Her work is so distinctive. I swear I don’t know how long I stared at these paintings trying to see the brush strokes. They’re imperceptible! I went to Paddington on the weekend just to find that Outre gallery has moved 😦 I’ll have to go this weekend or sometimes soon.. I know! I was walking towards where I thought Outré was from my work, when I suddenly came across it on Crown Street! So crazy! If I hadn’t been walking down Crown, I would have kept walking and missed it altogether! It’s a much nicer/modern space though! And close to lots of cool shops and restaurants 🙂 It’s at the Oxford St end of Crown St.
Definitely go before it finishes! So worth it!